Huge Blast Hits Entrance to Kabul Airport, Casualties Feared 0 out of 5 based on 0 ratings. 0 user reviews. While you are waiting for our today’s update of the Afghanistan Map of War series, read the breaking news from there. The explosion follows a series of suicide attacks in the Afghan capital killing dozens and injuring hundreds more. A large explosion hit the entrance to the Kabul airport Monday. “The explosion occurred at the first checkpoint of Kabul airport,” deputy Kabul police chief Sayed Gul Agha Rouhani told AFP. Heavy casualties are expected, according to Afghan officials. 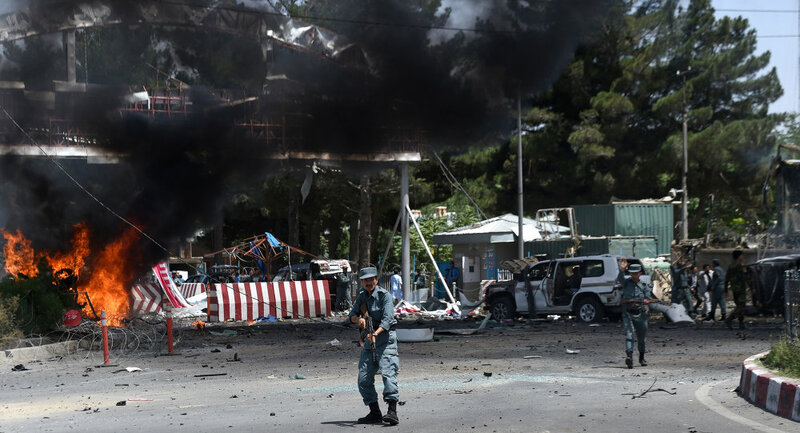 This is the latest incident in a series of suicide attacks in the capital of Afghanistan, which have killed dozens and injured hundreds more. Security in Afghanistan has become fragile following the withdrawal of NATO forces in December 2014 and an ensuing spring offensive by militants, including the Taliban and the Islamic State (ISIL).US-led NATO combat forces withdrew from Afghanistan in December 2014 after a 14-year occupation. On January 2, 2015, combat operations in the country gave way to a US training and support mission for the Afghan National Security Forces (ANSF), dubbed Resolute Support.